Art is an aftermath. It seems that only in retrospect are we able to see great art, to understand it for what it is. When it is first proffered, we respond with inspection, not introspection. It's tough to internalize the world around you, and all too easy to glance at the surface of a masterwork and meet it with a shrug. 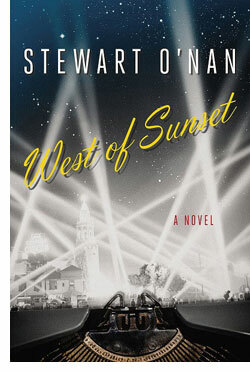 As 'West of Sunset' opens, an American master, F. Scott Fitzgerald, is hitting the skids in Hollywood. Zelda is in a madhouse, and Scottie, their daughter, an expensive boarding school. The Gatsby days are long gone, as are the accolades, and cash flow, they so briefly brought. In just a few sentences of sinuous, sweet prose, Stewart O'Nan sweeps us into this sumptuous world. By the time we hear the swan song this novel is over. We'll never read it for the first time again. Stewart O'Nan is one of our finest novelists, and we'd do well to get that now, rather than later. 'West of Sunset' takes a daring leap and succeeds in every way we could hope. It's a powerful portrait of an artist on the downside of a storied career, and an equally potent look at a troubled man trying to fight forces inside of himself and beyond his control. Within all the immersive specificity in terms of person, place and time, O'Nan finds a powerfully universal character. O'Nan the writer make Fitzgerald the writer a man anyone can find a kindred soul. One need not be great to feel great emotion. Start with the prose, which is gorgeous and evocative. O'Nan tells his story in a very carefully modulated third person, closely observed voice. It proves to be a smart move, as it backs away from the potential for pretension, but allows him to take up the first-person when crafting his own fictional letters from (and to) the author. There's a melancholic languor at work here, an understated beauty that is more powerful by virtue of the low-key approach. F. Scott Fitzgerald comes to life for O'Nan, and his entourage is equally lively. Fitzgerald is delicately complex and conflicted. O'Nan, wisely to my mind, decides to keep Fitzgerald's more ugly moments as a drunk offstage. They're not denied but subsumed by his longing for Zelda, his need for money, his need for recognition of the quality of his art. He managed to long for Zelda without a hitch, but money and recognition were far more elusive at this stage in his career. The supporting cast here is equally vivacious. This is a Hollywood novel, a great Hollywood novel, and you will think, "cast." Sheila Graham, his paramour in Hollywood, is gorgeous and nearly as complicated as Fitzgerald. Zelda is a lambent memory and a vertiginous reality, sweet and unstable. Round this out with a list of Hollywood and literary greats, from Dorothy Parker to Humphrey Bogart, living it up at poolside parties, and you have a book you will not want to end. But you know, you know in your already broken heart, that 'West of Sunset' does end, and how it ends. Don't let that stop you reading it. O'Nan finds page-turning plot tension in the drama of a life we think we know. He finds it in our lives, as we read his novel, ever slower, not wanting it — or ourselves — to end. But tragedy is beautiful, even if we are able to see that beauty only in hindsight.